Secretary of State Mike Pompeo has the intellectual capacity to compete with North Korea's most brilliant diplomats as President Trump prepares the United States of America to take on a global leadership role in the denuclearization of the Korean Peninsula, and he's made clear that only a full victory will be accepted. Secretary Pompeo has previously met with Kim Jong Un, and as a former Director of the Central Intelligence Agency, he has an understanding of the capabilities of the Supreme Leader, being aware of both his mental state and full capacity to bargain with the President of the United States of America. 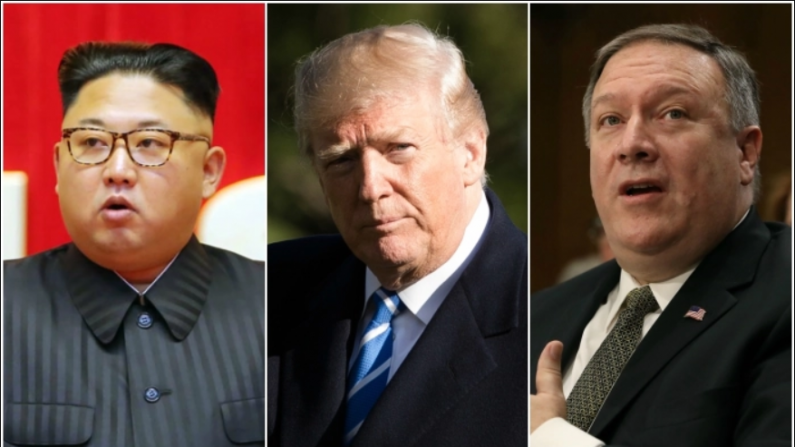 Most experts have suggested that it is within the interests of the President to immediately pull Kim Jong Un to the side, away from those within his government who will limit what the Supreme Leader agrees to. If President Trump can gain a handful of personal guarantees from Kim Jong Un prior to anything being implemented on paper, this gives the United States of America and the world an opportunity to declare an enormous victory for any finalized agreements. As Donald John Trump is the master of negotiations, being the man who coined the phrase. <i>”The Art of the Deal,”</i> there's little doubt that when he heads into the first handshake with Kim Jong Un that a “magical connection” happens. “The ultimate objective we seek with diplomacy with North Korea has not changed. The complete, verifiable, and irreversible denuclearization of the Korean peninsula is the only outcome that the United States will accept,” concluded the Secretary of State. This means that America, and essentially the entire planet; are all counting on that “Trump magic” in order to achieve nothing less than the full denuclearization of the once-hellbent desires of North Korea. North Korea is a brutal regime. There's no doubting this. What happened to Otto Warmbier is a prime example of how far they'll go to win. That being said, North Korea can be proud that they accomplished such an enormous feat in Nuclear power, and if Kim Jong Un’s intentions of providing a better life for his people are legitimate, America can be the first nation to create an entirely new alliance in the Pacific for both trade and stability of countering China. The Chinese would love nothing more than to swallow North Korea, and Kim Jong Un knows this. They haven't to date because of the United States of America has over 30,000 US troops in South Korea for nearly three-quarters of a century and the strengthened US naval presence in the Pacific. China also bullies many of the nations through the Pacific that has come under threat of North Korea's nuclear ambitions, including Japan, Guam, Philippines; and many other trade partners of the United States of America. The impending battle for the Pacific will determine global trade into the mid-2050s and give the United States of America a foothold on alliances with North Korea is certain to help combat the inevitable trade war with our number one competitor, China. It also flexes the muscles of the Military Industrial Complex for the United States of America, as it shows that our sheer force and might doesn't have to be used for war, but can be used to protect the planet from the threats of dictators and rogue regimes. This is something the Democratic Party fails to do, and under Barack Obama, nearly placed the United States of America into an endless war with China and North Korea, doing nothing to stop the growth of either evil. Communism is now and always has been the enemy of the free world, and its spread is being contained again under President Trump. There are going to be rocky patches with world leaders during this process, as we have all been witness to at the G7 Summit past weekend. The US can and will overcome, however, and we can outlast the entire planet. Our GDP is more than seven times that of all of the nations of the G7 combined. A trade war with the US would destroy them in the end, and despite their Marxist leadership showing arrogance as soon as Trump leaves the building, our President will remain victorious for the “Stars and Stripes” wherever it does battle economically, militarily, or through currency wars. President Trump also has strategic planning in place to use the growth of India’s enormous population to suffice the losses of any trade tariffs put in place by those of the G7, which simultaneously crushes China; and China is fully aware of this potential, which is why they've backed their influence out of the Kim Jong Un summit in Singapore. The US is in control and will remain in control. Asserting our dominance is key to global negotiations and it will be key to developing a legitimate roadmap to peace with North Korea. President Donald J. Trump will meet with North Korean leader Kim Jong Un tomorrow morning at 9:00 AM. Following the initial greeting, President Trump and Chairman Kim will participate in a one-on-one meeting, with translators only, an expanded bilateral meeting, and a working lunch. The United States delegation at tomorrow’s expanded bilateral meeting will include Secretary of State Mike Pompeo, Chief of Staff John Kelly, and National Security Advisor John Bolton. Press Secretary Sarah Sanders, Ambassador Sung Kim, and National Security Council Senior Director for Asia Matt Pottinger will join for the working lunch. At the conclusion of the summit, President Trump will participate in a media availability before departing tomorrow at approximately 8 PM for the United States. <i>When he leaves the summit the world will know his strength.</i> We're witnessing greatness before our very eyes. Through that very strength, President Trump has achieved peace, and as Mike Pompeo said, the guaranteed denuclearization of North Korea is the <i>only acceptable outcome</i> of this historic summit. C'mon guys it time to do what's right on this mess of a planet. POTUS and KJU will make a better chapter in the history books than Mulehead and his corrupt gang could ever imagine. Although the history books will record Muleheads witch hunt as a 2 year long soft coup that hopefully ends with all the swamp dwellers behind bars. Probably will read as the chapter where the world almost lost everything. Kim would be a fool to trust America after their track record of killing rulers in the middle east for israel. i'm just glad this has far fewer details than the Iran deal. So when we pull out we won't be screwed over as bad.